Description of "How to Establish, Manage and Grow a Small to Medium-sized Business (eBook)"
So much has been written about the subject of entrepreneurship and Small Medium and Micro Enterprises (SMMEs) development over the past decade that it is legitimate to ask whether this book has anything new to offer with regard to the subject. Even though there is so much information in the public domain about this subject, small businesses continue to fail. The truth of the matter is that starting and growing a business is not as easy as we are often made to believe. Research has shown that many small businesses fail within the first two years of operation. The cause of this high rate of failure is attributed to among other factors the lack of knowledge (know-how) on the part of the entrepreneurs and small business owners. The author is of the opinion that most books in the market on the subject address the academic side to entrepreneurship and as such are remote from the actual day to day challenges faced by entrepreneurs and small business owners. He writes from his experience of guiding small businesses and consulting with those who wish to set up businesses, which gives him the ‘voice’ of authority and makes one to take note of his opinions and comments. Whether you are enjoying the experience of owning a business but simply want to make it all more profitable, or whether you are finding it all a bit trying and are looking for ways to bring more profit and more fulfillment into your business, this book is full of advice that could be helpful. The reason for the high rate of small businesses failure is lack of knowledge of the basics for starting, managing and growing a business (know how). This book is aimed at all entrepreneurs who are seriously considering starting small to medium-sized businesses and those already owning them. It also offers readers practical advice on how to go about ensuring the successful establishment and maintenance of sustainable profitable businesses. The author in this book, points to the basic and yet most important factors to be considered by entrepreneurs and business owners to ensure the successful establishment of sustainable and profitable enterprises. The book is a guide intended to assist readers with the ‘how to’ of starting, managing and growing a small to medium-sized business. The author’s approach in tackling entrepreneurial challenges is universal even though written from the African perspective. He supports the key points raised in the book by citing personal experiences relating to topics under discussion. The book is written in a basic language which could be understood by most readers regardless of their educational background. In this book, the author highlights both the challenges and opportunities faced by entrepreneurs and gives practical advice on how to manage the challenges and take advantage of opportunities. While the author through this book targets people who wish to start businesses, entrepreneurs, and small to medium sized business owners in both the developing and the underdeveloped economies, the book has practical examples that apply to entrepreneurial development which may be useful to all entrepreneurs anywhere in the world. The stories related in this book are relevant, useful, and broadening understanding to assist in building the character of a balanced and knowledgeable business leader in all those who will take heed of the author’s advice. I am an author and an entrepreneur. My passion is on seeing others empowered and effective in pursuing their management and financial acumen. I strongly believe that true education empowers people to think independently and critically and helps them to perform according to their God given potential. Everything I write about is connected to the development of an individual relating to personal and business development and financial independence and this is the agenda my company is driving. I have written two books on small business development and one novel on determination, courage and hope. The three books are intended to help build balance in the individual as they begin their journey of financial emancipation. My passion extends to junior managers development and I am currently working on a model for this course. I am an MBA graduate with 17 years banking experience served with 3 major South African Banks at different management levels. I am passionate about people and their success in life and motivated by those who remain humble in the mist of thunderous successes. I am inspired by the resilient nature of the human mind, potent with power unimaginable to achieve things that even those possessing it cannot begin to fathom. 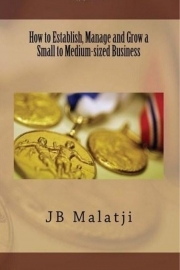 Reviews of "How to Establish, Manage and Grow a Small to Medium-sized Business (eBook)"